Remember that Sierra Nevada Rain Check Spiced Stout from about a month ago? That beer was courtesy of The Alemonger. He picked it up, along with several other beers, during his summer family vacation to Asheville, NC. 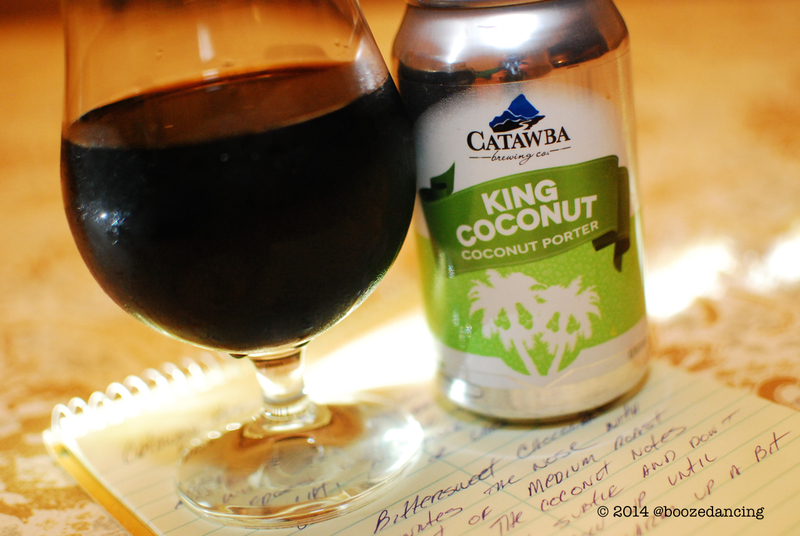 The Catawba King Coconut Porter that you see in the above photo was also acquired by The Alemonger during his trip to North Carolina, and once again, he was kind enough to share his Craft Beer bounty with me. Appearance: Deep dark brown with tan highlights at the edges when held up to the light. Not much in the way of foam or lacing. Aroma: Bittersweet chocolate dominates the nose with a hint of medium roast coffee. The coconut notes are very subtle and don’t really show up until I let it warm up a bit. Taste: A bit thin bodied with a light and somewhat fizzy carbonation with the chocolatey notes front and center when you take that first sip. The fist thing that comes to mind is a chocolate egg cream. A hint of bitterness shows up at the middle to lend some balance and to keep this beer from being one dimensional. A bit of toasted coconut shows up at the finish which leans towards the dry side with a lingering bittersweet chocolate flavor. King Coconut is definitely a beer that is best served at or near room temperature. Too cold equals too one dimensional where this beer is concerned. Let it warm up a bit and it gets much more interesting. While this isn’t a beer that I would go out of my way for, I would definitely try it again if I happened to stumble upon it in my travels, especially if it just happens to be on draught. Mille graze to The Alemonger! Whisky News Flash: Fall 2014 Whisky Extravaganza Schedule and a Promotional Code! I had a good coconut beer from Hardywood last week. But I feel like you gotta be careful with that shyte. Coconut beers with too much coconut flavor are some of the worst beers I’ve ever tasted. It’s like carbonated Hawaiian Tropic. Sounds like the Alemonger didn’t fail you though. I can totally get what you’re saying. This was definitely subtle, though to be honest, I haven’t had much in the way of coconutty beer. Alemonger definitely done good with this one!